Michael Grant set some shoeboxes, sealed with rubber bands, inside the circle of preschoolers. He showed the kids a collection of loose objects, and asked the kids to guess which were hiding inside each sealed shoebox. Each guess was a hypothesis and each preschooler, a scientist. They compared the objects and boxes, exploring the sounds, feel, and weight of each. Then they learned if their hypotheses were supported, as they opened each box to reveal what was inside. 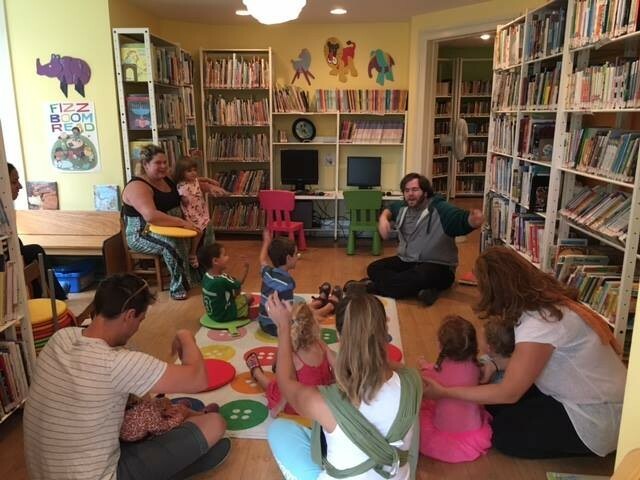 Grant, who taught at the Wayfinder Experience prior to becoming a librarian at Red Hook, is practiced in working with kids through different modalities and access points. He gets on the floor, incorporates role play, and isn’t afraid to dance or sing. Science education is an active focus for the Red Hook Public Library. Jardine and a colleague received a grant to train last year at the Lunar Planetary Institute, and they’ve been bringing that enthusiasm and knowledge back to library patrons ever since. The library runs regular science programs for homeschoolers on Thursdays, and are always increasing their already large collection of science-related books and resources for families. The library will offer more science camps this summer, like last year’s camp about Mars. And this May, the library will create a mini-museum display to showcase a recent donation of memorabilia from the Apollo space missions to share with the public. Kidology at the Red Hook Public Library, 7444 S. Broadway in Red Hook: Tuesdays at 10:30a; free and open to all; no sign-up necessary. In case of inclement weather, check the library’s Facebook page for updates on programming. For more information, call the Red Hook Public Library, 845-758-3241 or visit their website. Look for the Red Hook Public Library’s solar eclipse celebration this August! The solar eclipse happens on August 21st, 2017.